Academic desk pad features an elegant floral pattern with purple, teal and pink flowers to brighten your day with its charming design. Monthly calendar pages range from July through June to keep your plans conveniently in sight while protecting your desktop at the same time. Unruled daily blocks offer ample writing space to help you keep track of your busy schedule. Ruled notes section offers a handy location for listing monthly reminders, important dates and more. Full-year calendar reference is listed across the bottom of every page with the current month highlighted for easy identification. 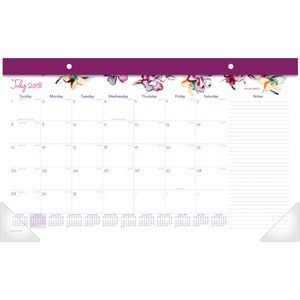 Wide top binding with two eyelets allow it to be also used as a wall calendar. Two poly corners keep each page flat while on your desk or wall. Durable backboard provides a sturdy writing surface. Desk pad is perfect for teachers, administrators, parents and more.